Creating meaningful spaces starts with figuring out what kind of story a client wants to tell, and an understanding of how art can bring that story to life. For one of our latest projects, our client wanted work that reflected its think outside-the-box company culture, engaged employees, sparked conversation, and helped bring energy and vibrancy to their space. Another important element was supporting their community by working with local artists. Our process always starts with research based on client goals. We dive into our network of artists as well as do additional artist research guided by the criteria of how clients want people to experience their space and their brand. In this case we brought together a wide net of artists who create work using diverse materials and dimension and were part of the local community. We teamed with the client to narrow these options into a final packet that combined pieces rich in texture, movement, color, and re-used materials. The focal point of the project became a monumental kinetic sculpture, hearkening back to the modernization of timekeeping that revolutionized society. This clock installation, which is entirely mechanical, features a complex network of moving gears, that are internally lit with subtle LED’s that radiate with energy, and a swinging pendulum. The largest gear weighs over 300 pounds and measures 12 feet across! This working clock symbolizes the productivity of the company and the spirit this financial-focused firm pioneered, revolutionizing investing. Employees are encouraged to wind the clock and set the time to keep everyone in sync and take part in the magic that its presence lends to the space. 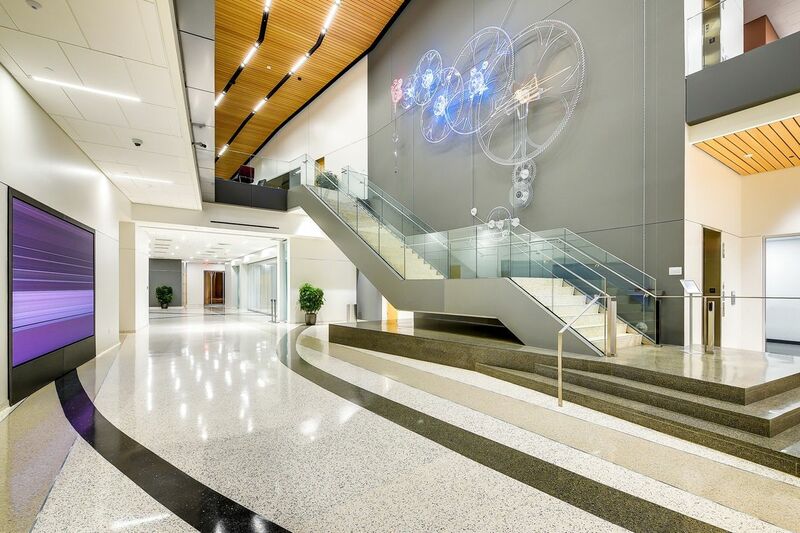 To get a closer look at this astounding office space and the one-of-a-kind art installations, view the project page for more images!